If you see Captain America riding his bicycle and stopping to help someone out this summer, don’t be alarmed. He’s taking time off from crime fighting for a good cause. 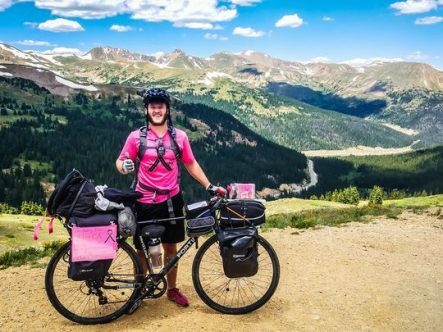 A Mount Olive man who last summer rode his bicycle across the country to raise money for a coworker battling breast cancer is preparing to head out again in a few months, riding “Portland to Portland” dressed as a superhero to raise money for pancreatic and testicular cancer research. Josh Johannessen, 26, will ride from Portland, Oregon to Portland, Maine alongside Scott Phillips, 27, and José Ignacio Alfaro, 26. All three live in the Budd Lake section of the township. Along the way they also plan to dress up as superheroes – Johannessen will be Captain America – and perform acts of kindness for people they see. 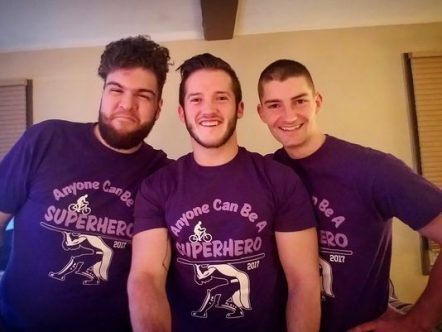 Money being raised on the trip will benefit Vickie Stickle Hennion, who recently passed away from pancreatic cancer, and Jason Vujosevic, who is battling a rare form of testicular cancer. Johannessen expects the ride to last five to six weeks, beginning mid-June and concluding by the end of July. Last year’s ride– a solo jaunt from Seaside to San Diego, Calif. and then up to Seattle – benefited Robin Reed, 43 of Byram, who was battling breast cancer. Johannessen, who worked with Reed at the Mount Olive Applebee’s, said he raised $20,000 during “Ride for Robin” and loved doing it, which is why he wanted to plan another trip for this summer. Johannessen said just recently brought his bicycle out for the season, the first time since last summer’s trip. Those memories include passing though some of his favorite states – Colorado was a highlight – and meeting new people. Some of his favorite interactions included a cyclist who offered him a warm bed as opposed to his planed campground on a rainy day, and a family visiting the U.S. from Holland who left him water on a particularly hot day. The biggest challenge during his last trip was the wind, which he hopes to avoid this time. Still, he managed to average 80 miles per day cross country and 100 miles per day up the coast, and had a blast doing it. Go tohttps://www.bikingportlandtoportland.com/ for more information or to donate. Shirts and wristbands will also be available for donations soon. People will also be able to sponsor “miles” of the trip shortly, according to Johannessen. Follow the group’s progress through social media on Facebook at Biking Portland to Portland, Instagram at @Portland_to_Portland, and Twitter at @port_2_portland. To directly help Stickle Hennion’s family go tohttps://www.gofundme.com/vickiesfund, and go tohttps://www.gofundme.com/jasonsfundraiserto help Vujosevic with his medical bills.